It has been great to see the recent focus on the state of public school education in the US through the Race to the Top program, the release of the documentary Waiting for Superman and just today, Mark Zuckerberg's impressive $100M gift to the Newark school system. From my end, while I don't make movies or have Mark's net worth, over the past few years, my wife and I have spent some time and devoted some of our resources to a local Boston charter high school called MATCH. Their record of achievement is amazing. The students of the school are selected randomly after entering the charter lottery and as a result reflect the demographics of the Boston public school district: 77% live in poverty as measure by eligibility for free/reduced price lunch programs by the State; 63% are African American, 30% are Hispanic and the remainder are Asian or white. Most of these students enroll at MATCH in 9th grade with math and reading abilities that are well below grade-level. 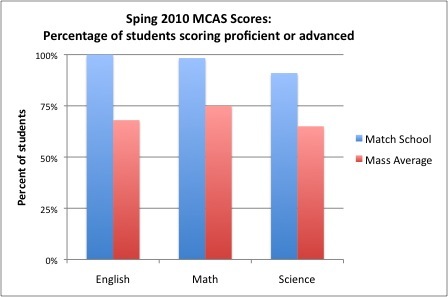 Despite this, by 10th grade the school is among the best performing instituions, as measured by MCAS scores and shown in the chart below, in the state of Massachusetts. Further, and most importantly, come graduation time, 99% of the students in the school's first seven graduating classes have been accepted into 4 year colleges. The importance of a unifying vision. Everyone at MATCH is 100% committed to achieving the school's goal: create a high performing environment where all students can change the trajectory of their lives by not just going on to college, but by succeeding in college. This vision orients all of the school's activities, just as a unifying vision should orient the activities of your start-up. The importance of consistent, strong leadership. MATCH is blessed by a great founder with vision, Mike Goldstein, a phenomenal Executive director, Alan Safran and a superb High School Principal, Jorge Miranda. Each has been part of the school since its earliest days and they set a tenor for the school that permeates the rest of the organization. The importance of creating a culture of accountability. Match does this by setting high expectations and demanding a lot of their team (in their case both students and teachers), while at the same time providing the right resources, training and support to help attain those goals, and then measuring and tracking progress very closely. The importance of innovation. While having an audacious goal is important, at times you need to be willing to do things differently to achieve those goals. In MATCH's case, their innovations have included the MATCH Corps, a group of 90 recent college graduates who provide 2 hours of individualized tutoring a day to each student in the school, an extended day for additional academic programming and creative collaborations with two local universities, BU and MIT. The importance of growth, but only once you have figured things out. When MATCH started, they focused all their attention on building a top-performing high school. Only once the model for doing so was well developed and honed, did they start to expand such that now they have a middle school, an application out for another charter in Boston focused on non-native English speakers, and a state-approved teacher training program that sends teachers not just to MATCH, but to other schools around the country. So while many talk about lessons from business that can be brought to education, I have been thrilled over the years to take some lessons from education into my business. There has been a lot of debate lately in the investor community about VCs vs SuperAngels and the best approach to financing early stage companies. If you are an entrepreneur, you could spend all day catching up on the blog/twitter traffic, which of course makes it hard to focus on actually building your business. If you do have the time and want to wade in, these posts/comments from Fred Wilson, Brad Feld, Eric Paley, Dave McClure and David Hornik (via TechCrunch) will give you the overview. How much money do I realistically need? Put together an overall multiyear plan for your business, assume it takes longer and more money than what the plan suggests, and then determine what that means. The simple point here is that the financing sources that are appropriate if you need a total of $1 million are different than if you need $10 million or $100 million. What amount of capital upfront allows me to significantly decrease risk and increase valuation? While every entrepreneur would like to raise all the capital required per question one in one fell swoop, this is often unrealistic and will result in a tremendous amount of dilution. Instead, think about determining what allows you to prove you can build your solution, that customers will adopt and it fits a market need, there is a sustainable business model and that you have a path to access the market. Funding through milestones such as these will allow you to raise subsequent rounds of capital at higher prices. In the digital media world this often can be accomplished with less capital, in other segments it requires more, but regardless of the segment you participate in reducing risk and demonstrating potential upside will always translate into higher valuations. Who do I want to work with, what do I expect to get out of them and are our objectives aligned? When you bring on an investor, especially if they are on your Board of Directors, you will be together for a long time. So make sure you both enjoy working with them, you see eye to eye in terms of the market opportunity, you are aligned in terms of what you expect from the investor and what they will be able to deliver, and there is agreement on the the ultimate goals for your business. One of the greatest sources of conflicts between entrepreneurs and investors happens when this alignment is not in place from day one. In all of this, avoid the trap of telling an investor your strategy is what you think they want to hear. Instead, if you focus on what is right for you and your business, the answers should come to you.